This groundbreaking guide provides a deep understanding of how to achieve enterprise performance management objectives, backed up by first-hand accounts from Fortune 500 companies who are winning by building accountability, intelligence, and informed decision-making into their organizational DNA. 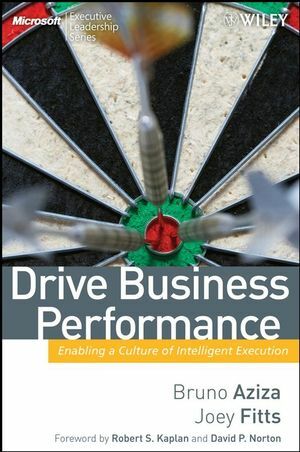 Drive Business Performance explains the competitive advantage experienced by organizations that create and manage a "Culture of Performance." Bruno Aziza has led marketing, sales, and operations teams at various technology firms, including Apple Inc., Business Objects, and Decathlon. Bruno has worked and lived in France, the U.K., Germany and the U.S., and holds a master's degree in business and economics from three European institutions. He currently works on Microsoft's Global Business Intelligence strategy. Joey Fitts has consulted over twenty-five of the Fortune 500, guest-lectured at Harvard Executive Education programs, raised over $16 million in venture capital, and served on the Board of Advisors for InterVivos and the Computer Technology Industry Association (CompTIA). He currently works on Microsoft's Global Business Intelligence Alliance strategy. Chapter 1: The Six Stages of Performance Management. Chapter 6: Pull It All Together: What’s Your Organization’s Stage?